A challenging install in a remote area of Alaska. 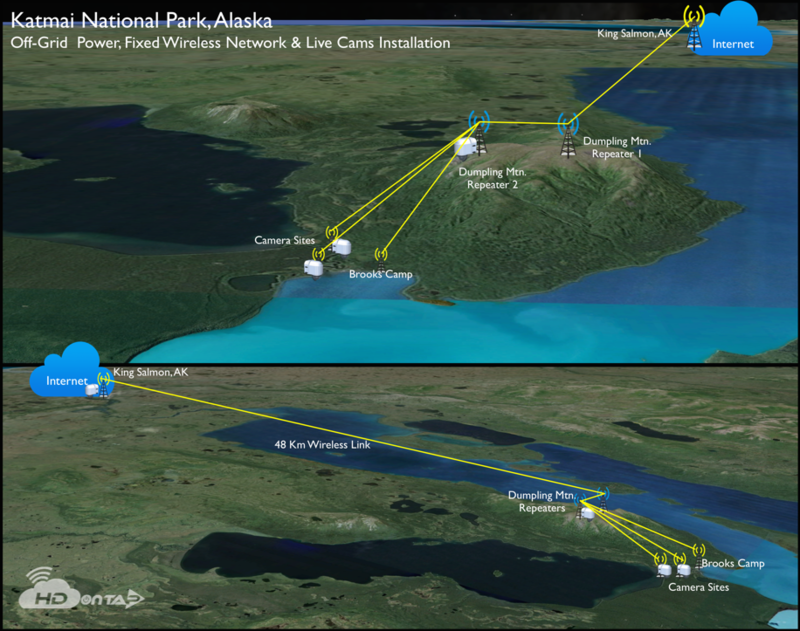 With internet service and grid power over 35 miles from the camera sites, an off-grid power and fixed wireless network solution was required to broadcast live video of the brown bears and the salmon feast. The repeater sites on top of Dumpling Mountain are powered by a customized hybrid solar, methanol fuel cell and wind generator solution designed by HDOnTap. The 8 cameras located around Brooks Camp and in the Brooks River are powered by three separate solar arrays with the Lower River site backed up by a methanol fuel cell allowing us to extend the season when sunlight hours lesson as wniter approaches. The fixed wireless signal travels over 55km from the dedicated internet source in King Salmon to the camera sites at Brooks Camp. Sling loading in supplies beneath a Bell 206 helicopter. The last of the equipment to arrive via helicopter at the Dumpling Temp reapeater site. The dumpling mountain location repeats the wirless signal from the top of the mountain down to multiple locations at Brooks Camp where live cameras are installed. There is also a live camera installed at this site bringing breathtaking live views of Naknek Lake, Brooks River, Brooks Lake and the Valley of 10,000 Smokes. Not a bad way to get to work! And the view isn't too bad either. Transportation to and from the site with materials is done via helicopter. Our patented self cleaning enclosure systems allow you to remote wipe or wash the dome lens. Our patented self cleaning camera enclosure systems X|Smart Web Interface allows you to remotely control individual accessory power ports, monitor and control temperature and power usage and wipe / wash the camera done lens. Visit the X Stream Designs, Inc. website to learn more about the X|Clear and X|Rain enclosure systems. Dumpling Mountain is often in the clouds! At 2,400 and 2,000 foot elevations, Dumpling and Dumpling Temp are quite often in the clouds. Installation of the fuel cells this year gave us piece of mind during long stretches of no sunshine to charge the battery banks. Visit the X Stream Designs website to learn more about these revolutionary enclosure systems! 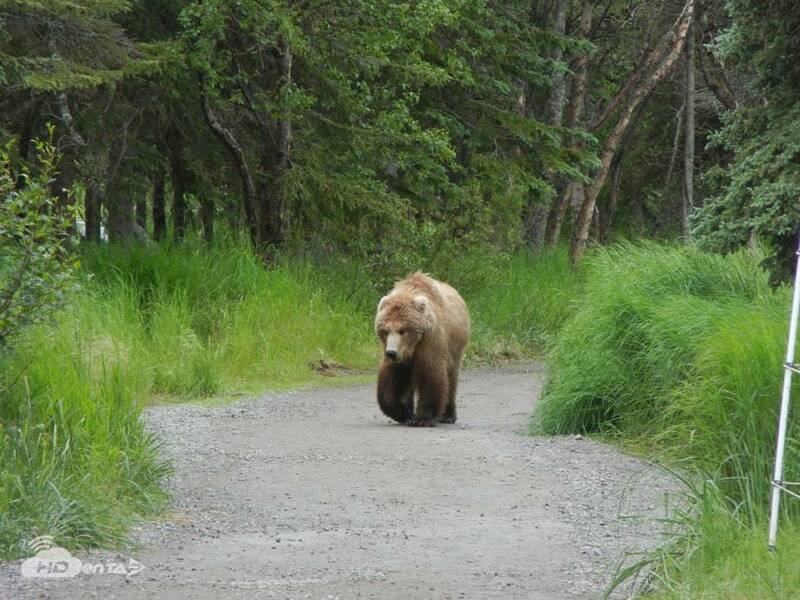 Alaska's winter weather isn't always kind! A 100mph plus wind storm took down this tower during the 2013/2014 winter season. Unloading gear to start the installation! Brooks Falls where the salmon feast takes place. All of the power systems are built and designed to allow for remote monitoring and control of power. 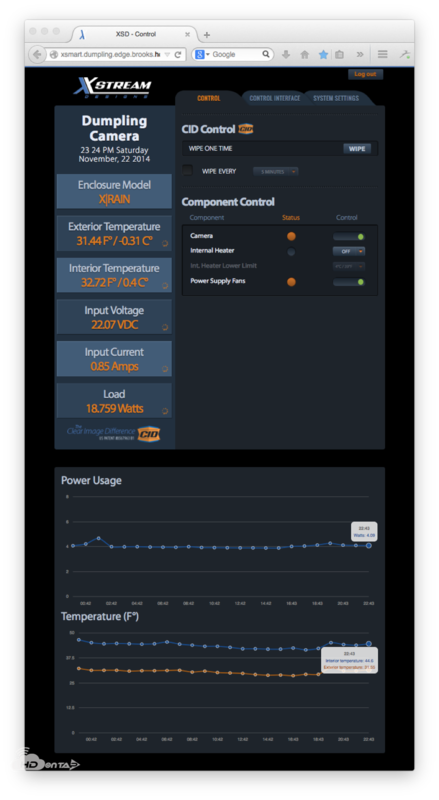 We're able to monitor and control temperature settings within the eclosure systems maintaining a temperature just above operating specs thus reducing the power demand on the stored energy in the batteries.